A woman with flaming red hair, sunken eyes, and a Cyclopean chin materializes on several canvases of the superb pre-Raphaelite exhibition at the National Gallery of Art in DC, Pre-Raphaelites: Victorian Art and Design, 1848–1900. If you have ever found yourself helplessly mesmerized by the neurotic hyperrealism of the Brothers, one look at her face should be enough to shock you out of medie-Victorian dream land. Her unfortunate aspect is testament to human weakness and the impossibility of making a perfect work of art. The work of rehabilitation is even now incomplete, but this new exhibit, imported from the Tate Gallery in London, and embellished by NGA curator Diane Waggoner, goes far toward completing it. It adds to the paintings the array of sculptures, poems, stained-glass, murals, and tapestries with which the Brotherhood decorated the private drawing rooms of their political patrons. You see that they were aiming at a complete overthrow of the English mannerist aesthetic, inherited from Raphael and elaborated in England by Sir Joshua Reynolds. The Brothers did for the fine arts what Wordsworth and Keats had done for poetry. The paintings are difficult to assess. They beg to be regarded as serious, thoughtful, and exciting to the imagination, but to the degree the electric greens and purples of Arthur Hughes stimulate they eye they perversely escape the mind. Their first important critic, Walter Pater, could say nothing better of Rossetti than that his meanings are “always personal and even recondite, in a certain sense learned and casuistical, sometimes complex or obscure.” Here Feeling is illuminated and embalmed. True Love is drowned, rejected, or doomed. 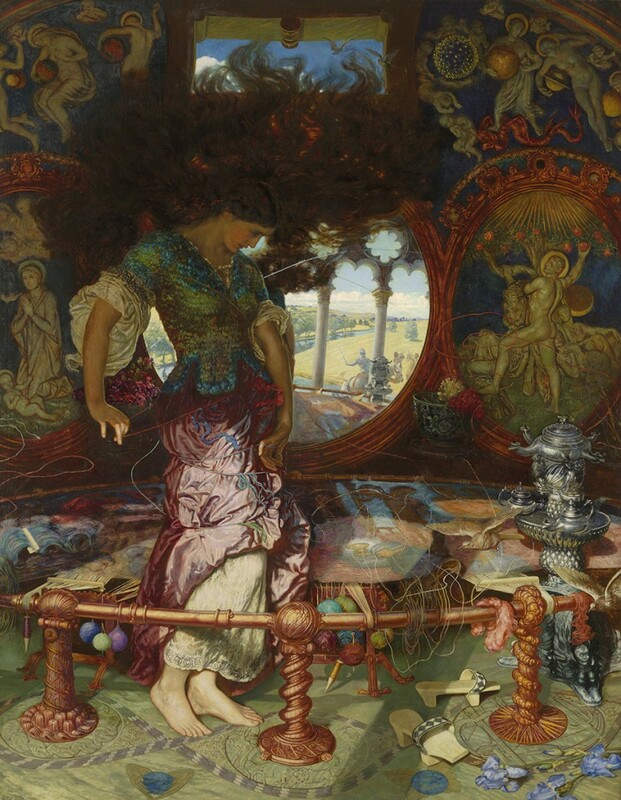 Most of the paintings tell striking stories, but, with some exceptions from William Holman Hunt and Ford Madox Brown, rather than offer an interpretation of the story they attempt to render their hermetic power. 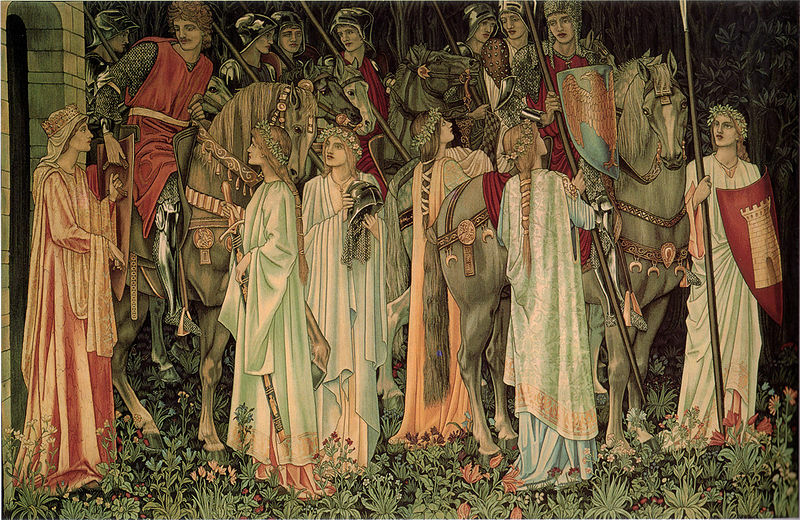 Dr. Michael Clune wrote an excellent article in The Chronicle of Higher Education on February 11 that speaks to the meaning of the pre-Raphaelite art. What if what you felt the first time you heard a song could last forever? What if you discovered an immortal song, a song that never gets old? Listening to it provides you with an experience of unfading freshness, of unending novelty. To imagine such music is to imagine a device for stopping time within time. This music would be like a hand grasping your heart, like a lover’s kiss, fused with a star’s immortality. We quickly lose our appetite for beautiful things—a melody, lemonade on the lawn on a sunny blue July day. There is a small window of time when we tell ourselves, “I wish this could last forever,” and then we begin to sweat under the sun, our stomach growls, the melody is repeated ad nauseam, and we recollect Keat’s lines from Ode on a Grecian Urn, “Heard melodies are sweet, but those unheard / Are sweeter.” Habit deadens our senses; novelty enlivens them. There’s no more chance of making a work of art that’s eternally young than there’s chance of building a perpetual motion machine, though some have tried. Clune argues that the modern experiments in stopping time are characteristically Romantic; in the limited scope of his essay he doesn’t discuss the pre-Raphaelites, but the same observations hold true for them. Rather than experiment with the uses of empathy à la Proust; addiction, as de Quincey; or art about art—”blueprints for an immortal image,” in Clune’s phrase—they made use of the immutable freshness of England’s spiritual and mythological past as it figured in public memory. The quest for the grail was frozen, like the two lovers on Keat’s urn. The exhibition closes with a masterfully chosen work, The Lady of Shalott, painted by Hunt in 1905 at the far end of his career. The Lady, having spent her life weaving images of the world she sees in her mirror, has, at the sight of Lancelot’s face, broken the commandment and turned to gaze upon the real thing. As soon as she does, a wind pours in the window, her mirror shatters, her tapestry unwinds, and she soon dies. It is an allegory of the despair that accumulates after years of satisfying one’s imaginative appetite with dreams and visions, knowing that to look on the mystical source of those dreams is impossible, and deadly. There is another exhibition currently at the gallery. It is a solitary object, standing alone in a small rotunda on the northwest wing of the west building. It is the David-Apollo of Michelangelo (friend of Raphael), who has lighted on this city with the glory of a demigod. His feeling for human form as much surpasses the Brothers’ figures as their vivid colors surpass his statue’s milky cream. The statue is unfinished, like much of Michelangelo’s work. The flesh is still pockmarked by the artist’s scalpel, and the back is weighed by an uncut rectangle of stone. I’m transported, not to faerieland, but to a workshop in Florence, where some unimaginably glorious work is taking shape under the meticulous care of the master. Hark! His old enemies the Medicis have overthrown the Republic and Alessandro is despot. Soon after Michelangelo leaves his workshop to his apprentices. The work is transfixed, thrilling with potential. Scholars can’t agree on whether it was intended be a depiction of Apollo or David, so it is called by both names together. 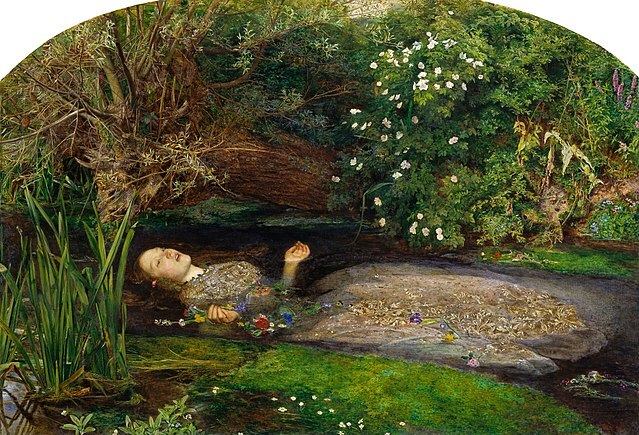 It is more alive than anything the pre-Raphaelites produced. The David-Apollo has, at the cost of the perfect finish, gained immortality.